One of the worst parts of travelling with kids is long distance travel, whether it be on a plane, train, bus, car or boat. Kids like the fun stuff and the transit is rarely the fun part of family travel. Flying with kids can be one of the most challenging travel experiences and even more so if you happen to be flying with a toddler or baby. 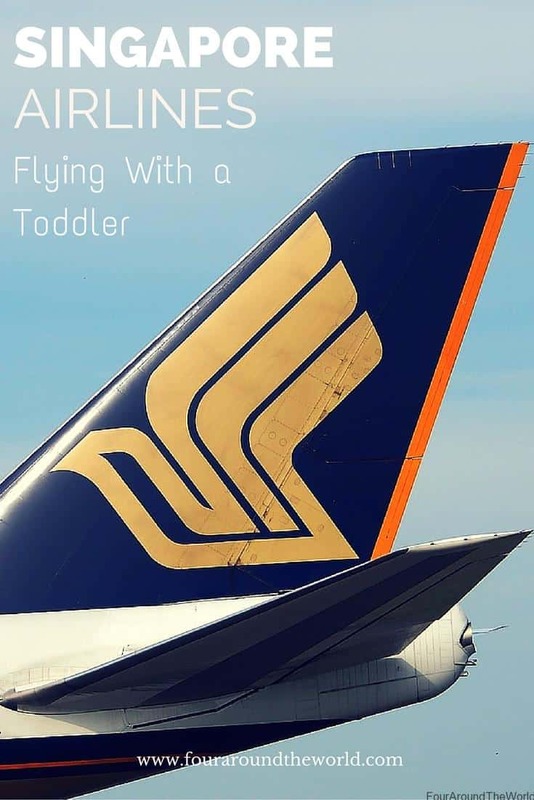 When we flew with Singapore Airlines for the first time, it meant flying with a toddler. Although it wasn’t our first time flying with a toddler. However, being our first long haul flight with a toddler, we wanted to be sure to pick a quality airline to ensure a safe and comfortable trip… well as comfortable as it can get flying with kids. Find our Singapore Airlines economy review and our experiences of using an airplane baby bassinet for the first time. Our check in experience at Brisbane International Airport was quick and easy, as was our stop over period to and from at Changi Airport. Thankfully there was plenty to do at Changi Airport to keep a toddler amused for a couple of hours during the stopover each way. It is our favourite family friendly airport in the world. We have a family friend who is a travel agent. While we normally book a lot of our travel ourselves online, long haul international flights are sometimes the thing we end up booking through a travel agent, so he assisted us with planning our flights to Vietnam. Initially I was reluctant because the flights left relatively early in the day and past experiences have meant that early flights have resulted in worse jet lag. Although Vietnam is thankfully a lot closer than Europe so we went with the earlier flights. Our travel agent friend let us know that because our daughter was under 2, she was eligible for an onboard plane bassinet during our flights at no extra cost. I actually hadn’t heard of these before, but it sounded good so we were happy to try it out. Plus it meant sitting in the bulkhead seats of the plane, which gives far more leg room. A luxury you normally pay extra for. Your best option is to book the Singapore Airlines baby bassinet seat at the time of making your flight booking, as they are a case of first in first served. If you have not organised a bassinet, Singapore Airlines may not be able to organise one on the day, as others may have done so in advance. Or it may mean sitting apart from the rest of the family potentially too which is hard when you are flying with a infant. Once on board, we settled into our roomy bulkhead seats and a flight attendant came to see us almost straight away to provide us with an infant seat belt. These are mandatory for children under 2 seated on a parent’s lap, and are essentially an extra seat belt that loops through the existing seat belt. Once we were up in the air, and the no seat belt sign was off, we put our daughter in the bassinet. She wasn’t too keen initially, however the Singapore Air bassinet soon became a novelty. We will admit at times during our flights with Singapore Airlines, she was unsecured and playing in the bassinet. But seriously, can you imagine keeping a 14 month old toddler restrained? We were beginning to think she was never going to sleep in it though until finally she drifted off and gave us some peace and quiet to catch up on some onboard entertainment. The Singapore Airlines baby bassinet measures at 768mm (L) x 298mm (W) x 158mm (H) and are recommended for children up to around 10 months based on average size, however if your child is small, they may be able to fit past this age like ours did. The Singapore Airlines bassinet weight limit can support a maximum weight of 14kg. Our daughter was well below this weight even though she was 14 months at the time of our travel. You can also travel on Singapore Airlines with an infant car seat, however be sure to check out the info on their website to make sure your child’s safety seat is suitable for onboard. If so, it can clip into the seat beside you for added safety. Please note if you plan to take your infant seat on Singapore Airlines, you will be required to pay for a seat for them. It is not a requirement to purchase a seat for infants under the age of two otherwise, so this will be an extra cost to be mindful of. A Singapore Airlines post weaning meal was provided for our toddler during our flight. The problem was, she drifted off when the meals were coming around and we asked them to hold her meal while she slept. We were advised for safety reasons, they could only hold her meal for 2 hours. Thankfully she woke up just before the time frame was up. She was provided a Singapore Airlines post-weaning meal due to her age. However it wasn’t great. She barely ate any of it because it resembled baby slop. The other frustrating thing was that every time one of her meals came out on any of our connecting flights, they were so hot we could barely touch them, let alone give them to a toddler. This is again for safety reasons. It was very challenging trying to hold her with 3 meal trays cooling in front of us. That was probably the one negative we found with Singapore Airlines and flying with a toddler, however we do understand the need for them to be at this extreme heat to minimise the risk of bacteria so it’s one of those things that can’t easily be avoided. Our meals were fine thankfully and our daughter shared a bit of ours, since she wasn’t too fussed on the post weaning meal provided. We got a good variety of food and they had a Singaporean influence to them, but also with some more Western accompaniments. They also bring regular snacks and drink service as well so you don’t have a chance to get hungry along the way. 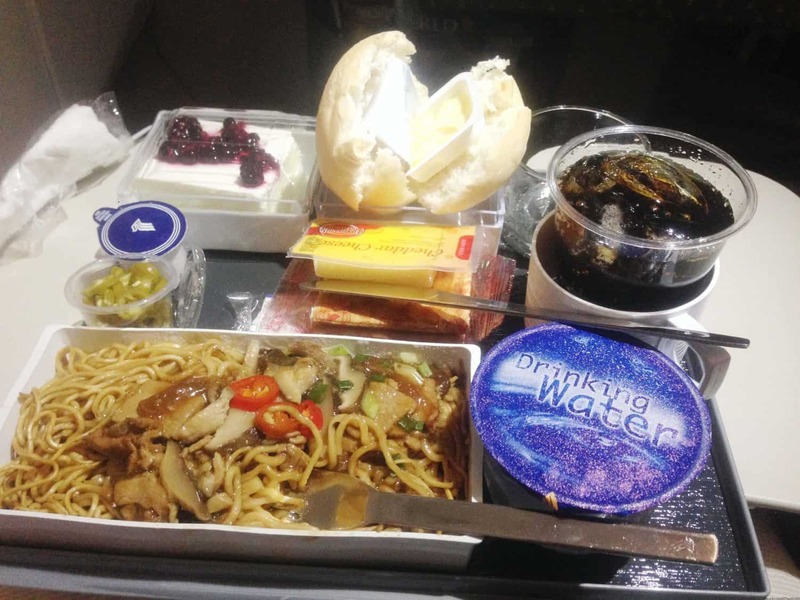 Not a great photo but this is one of our Singapore Airlines meals. I didn’t have a chance to photograph the post-weaning meal with our juggling act of trying to hold a toddler. If you are travelling with older kids, the Singapore Airlines child meal options are smaller than the adult ones and have food more suited to kids taste buds, rather than the array of flavours you see above. The Singapore Airlines child meal options are pretty basic, so if they have any dietary needs, make sure you arrange this prior to your flight. We would also suggest you do this for any Singapore Airlines baby meal, as this is not always a standard inclusion, since kids under 2 fly for a small fraction of the adult ticket price. Aside from the meals and the bassinet provided for babies and toddlers on Singapore Airlines, they actually have many other great perks when travelling as a family. One unexpected positive was the fact that Singapore Airlines have a supply of nappies and other baby essentials on board in case parents forget them or don’t pack enough. We didn’t need them but it was good to know the option was there. Kids are also provide an activity pack or toy for kids towards the start of the flight. For toddlers, this is usually a soft toy and our daughter ended up with two stuffed plane toys from our holiday. I think she would have enjoyed the activity pack much more but they are for the bigger kids. We usually pack our own travel activity kits to keep our kids occupied for flights, and we had a few things on hand to entertain her already, even at 14 months. Overall we were happy with the airline and the service. The staff were friendly and quick to respond to requests. Our seats were comfortable… for aeroplane seats, mostly due to the bonus legroom of being in the bulkhead seats. This meant no toddler headphones either so I had to hold them in place when I was sharing with little miss. The SIA bassinet was a fantastic help in allowing us to be hands free at times and have somewhere to put our daughter to sleep. The few times when there was turbulence and we had to take her out was a bit of a pain when she was actually asleep. However, it also became useful for storing items such as toys or empty food trays when our toddler wanted to play on the floor or watch some onboard entertainment… with those giant headphones. I love pre-planning my onboard entertainment before I fly and always look up what new release movies are showing. As for what’s currently showing on the Singapore Airlines movies onboard entertainment, you can find the latest releases here. The Singapore Airlines onboard entertainment system includes a kid friendly section that has family friendly movies, television shows, music and games. It is quite user friendly for older children to find their way around on their own, however toddlers and young children may require some navigation assistance from you. I would definitely recommend you get some suitable children headphones before you fly internationally, as I am not aware of any airlines that provide toddler headphones for plane travel. From our experiences of flying with a toddler, both domestically and internationally, there are a few things we have learned to help save our sanity during the flight time. Taking the time to plan ahead will make a huge difference to your flight experience, although nothing guarantees an easy time. Toddlers like their space and hate restrictions, so being stuck on a plane for hours is not much fun. 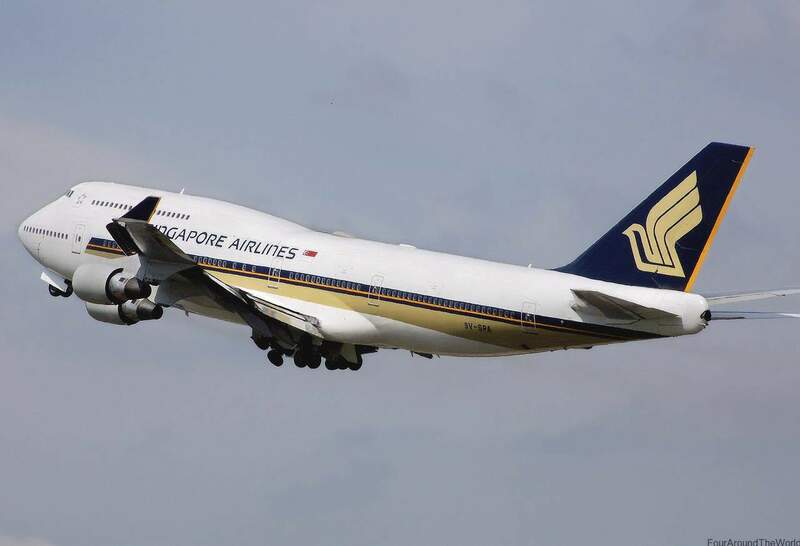 Our flights with Singapore Airlines were in their economy class section, which is the most low priced option available. They have several different flight classes including premium economy, business class and first class available. Check Skyscanner to find the latest flight prices and set up alerts for your travel dates. Economy class comes with most of the same entitlements as the more expensive flight class options. The main differences are that economy class is less roomy and the food is not quite as fancy. The more expensive classes often come with higher baggage entitlements too. In saying that, Singapore Airlines have indicated their economy class has more space than many other economy seating sections on planes. More space is always a winner! Singapore Airlines meal options can be made prior to your flight, via the online flight management system. This is possible for all classes, including making the choice of special meals for dietary purposes. Singapore Airlines baggage for economy class includes 30kg of checked baggage, which is higher than many other long haul airlines. This increases to up to 50kg per person for first class and suite class tickets. If you are flying on different airlines within your destination country, it is always good to check their baggage allowances before you travel as they may not allow as much. If this is the case, the easiest option is to go by their maximum allowances to avoid any unexpected fees and charges. We would be happy to fly Singapore Airlines economy in future, as the service was great, the staff were friendly and the facilities were modern and well maintained. The only fault would be the toddler post-weaning meals and how hot the meals are when they come out (although this is understandable for food safety reasons). If you are flying with a toddler or baby, it is well worth booking a bassinet and a bulkhead seat since there is no extra costs associated and even if your child barely uses the bassinet, the extra leg room is a great bonus. The luggage allowances for Singapore Airlines are higher than several of the other similar priced airlines and their economy seating is slightly more roomy, although in our case with bulkhead seats, we had plenty of room to stretch our legs due to the airplane bassinet. You can find out more about Singapore airlines via their official website. Singapore Airlines has their own rewards program – Krisflyer, which is a partner of some of the other major frequent flyer programs as well. You will find details on the rewards program and how to sign up via the website also. And to help keep you organised, come check out our ultimate South East Asia packing list, with a free printable checklist to make sure you don’t forget a thing! Nice writeup Holly.We are a couple from India, who love traveling and travel blogging.We have a 2 yrs old,we haven’t gone on international holidays with her, but we are planning to soon.If you could tell me what all snacks are allowed on the airlines to Singapore and Europe (france), it would be a great help. Can we carry tiny lunch boxes with her favorite semi solid snacks or only packaged food is allowed? We are flying with Singapore Airlines in November to Perth With a toddler who will be 22 months do u still recommend a bassinet or will it be a bit small?